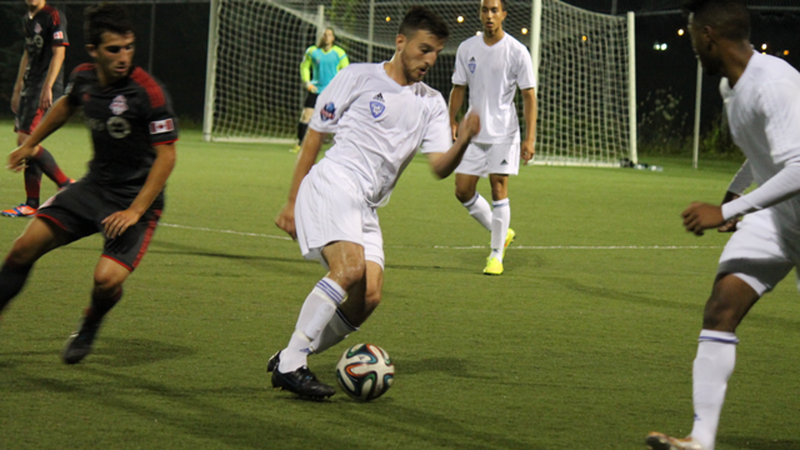 In an L1 Cup football match that had its share of ill temper, Dylan Sacramento struck for a pair of goals to lead TFC Academy to a come-from-behind 2-2 draw with ANB Futbol Wednesday night. At several points the game was close to getting out of control, with yellow cards shown but no players sent off. ANB struck first in the highly competitive contest, as Belrum Vartanian fired a fine curling shot past TFC keeper Mark Rogal from twenty yards in the twenty-fourth minute. The lead held until the thirty-sixth minute, when Shiquan Lowe of ANB was yellow-carded about twenty-five yards from goal. Sacramento stepped up and sent a perfect free kick off the post that ANB keeper Haydon Armstrong was powerless to stop. The game’s key incident came in the seventy-eighth minute, as a number of TFC players congregated near the sideline while a member of their team lay injured. While they believed play was stopped, the referee let the game continue and Kristofer Michael found the net for ANB to put his club up 2-1. TFC Academy were furious with the ref but he wasn’t hearing it and the goal stood up. “It was very disorganized, there was an injury on the play, [and] it seemed like the opponent almost got an advantage on account of it. I think the sideline was a little bit surprised,” said TFC Academy head coach Michael Stefano after the match. Sacramento was able to meet a corner in the eighty-eighth minute and nod the ball in to get the equalizer for TFC. He was visibly upset as he ran back up the field, yelling at the ANB bench. The fourth official alerted the ref, who yellow-carded Sacramento for his display. “On the second goal for them, we got kind of caught off guard. For us, it (scoring the equalizer) was about having heart in the box. I felt it was going to come near post, and got the header and flicked it into the net,” said Sacramento. Michael said he was pleased to get the second goal for ANB. “I thought we played really well as a team. I thought we connected really well at the back. We had a lot of chances in the first half,” said the midfielder. “My teammates worked really hard, and I’m proud of our game today,” said Michael. 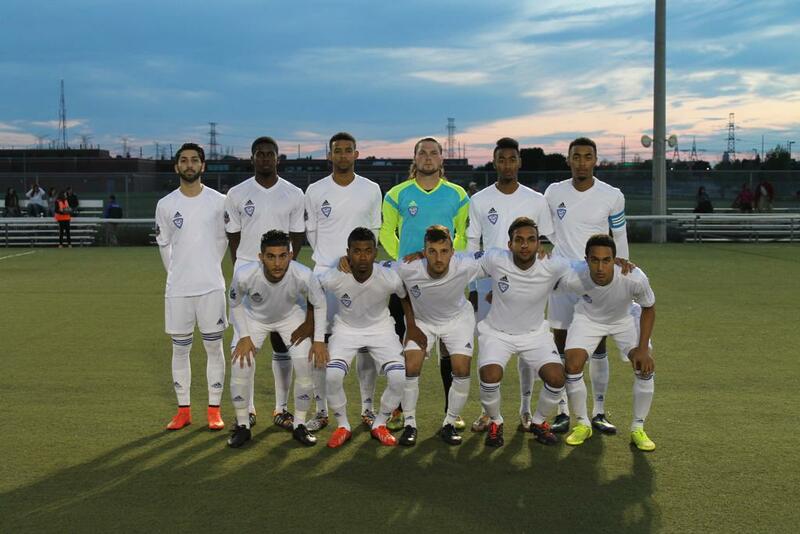 ANB head coach Bassam Naim felt his club improved after dropping a 3-2 League 1 regular season match to TFC Academy two weeks ago on the same field. The draw marked the first point in three Group A Cup matches for ANB, which sits in fourth place with one point. 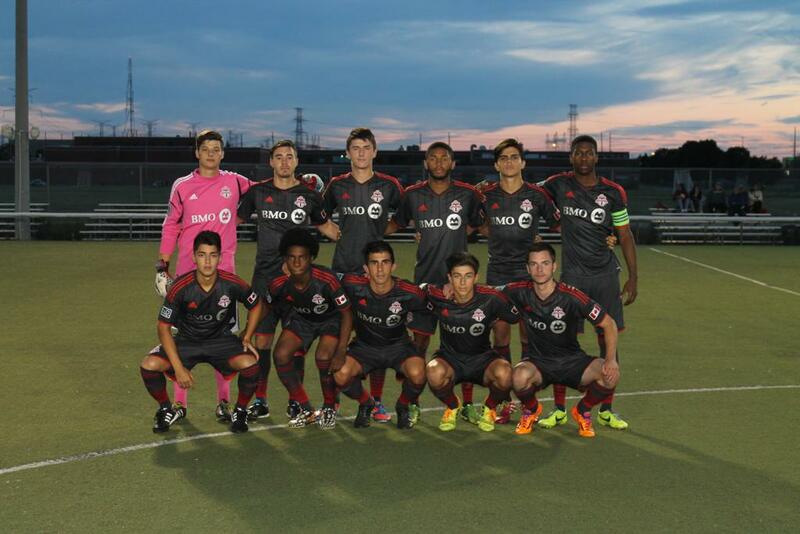 TFC Academy are in second place with four points after two matches, with a win and a draw. Next League 1 regular season action for the teams has TFC Academy home to Durham FC at the Kia Training Ground on Sunday, Aug. 10, at 1 p.m. ANB Futbol are not scheduled to play in league action again until Wednesday, Aug. 27, at 9 p.m. at the Soccer Centre in Vaughan versus Vaughan Azzuri.